Whoa! Now that was one wild and epic ride! 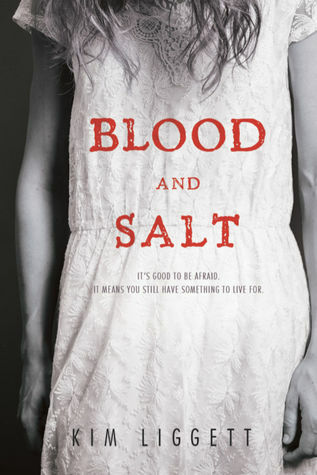 Blood and Salt by Kim Ligget is one of the most unput-down-able books I have read in a long time. I literally could not stop reading. I'm talking about head nodding at 2am but fighting back the searing pain in my dry, tired eyes because I must read one more chapter. I'm talking about sneaking the book under my desk at work to devour a page or two. I'm talking about dabbing sweat marks off of the pages because I couldn't stop reading while trudging away at the gym. This book did not leave my hands until I turned the last page. And I tell ya, what a bittersweet moment that was! Yes, it's always a wonderful feeling when You finish a book, but that feeling is quickly replaced with dread and longing because now you will miss this story, miss those characters, and miss the time you spend reading that tale. Kim Ligget's writing while capture you the after the first page. It does not take long for her to whisk you away and join Ash and Rhys on their quest through Quivira. This book made me laugh, it made my heart leap and it made the hair rise on my arms as goosebumps crept their way up. Eerie, romantic and gruesome, this book had everything and more! You will fall in love with Ash and Rhys right off the bat. Though they both were armed with a dry and sarcastic humour, they were blessed with a bond that not even the darkest of spirits can break. Their love was a powerful tether throughout this entire book. It was evident how important they were to one another. Another thing that I loved about this book is you never really knew what the true intentions of each character was until near the very end. Just as I thought the book was going in one direction, I was completely blindsided by an epic twist. Blood and Salt is, above all else, a story about love. And how powerful that bond is, and how that bond will never die. A bond between siblings, a bond between mother and child and a bond between lovers. A part of me is sad that I have finished this book, but knowing that there will be a sequel helps lessen the blow. And the wonderful thing about reading is you can always revisit these characters whenever you wish, and I know I will be revisiting Blood and Salt...More than once! Please, if you were to ever take my word on any book, let it be this one! As the October days grow cooler, curl up and lose the time with this rare gem. It is truly a book that will stay with you long after you finish! I can't find the book online. Is it available? I'd like to read it. You've pictured it so lovely. If you have the link, I'd appreciate that. Thanks, Cathy.